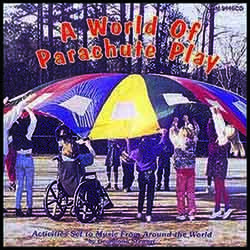 This popular CD features songs from around the world and unique parachute activities that reflect the culture of the country. Guide with lyrics and instructions. Turn kids on to teamwork as their gross motor skills develop while playing easy parachute routines. This popular CD is adaptable for special needs. Guide with lyrics and instructions. Take a parachute, add some folk dance steps & you've created an exciting new enthusiasm for enjoying parachute play! Do the Mushroom, Umbrella, Inside The Mountain & others to Irish Washerwoman, Seljancica, Mayim, Mayim & more!